Ankle sprains are generally regarded as some of the most common injuries seen in sports, if not the most common. Approximately 23,000-25,000 ankle sprains occur in the U.S. every day, which results in $2 billion worth of healthcare costs annually. These injuries are most frequently seen in sports that require quick direction changes, cutting movements and rapid acceleration and deceleration, which is why about 41% of them occur in basketball. Ankle sprains are also common in football and soccer, and the higher the level of activity, the stronger the chance of spraining the ankle. After a first ankle sprain, between 35-73% of patients report ongoing symptoms, and the risk of having another sprain is about 70%. This is why effective interventions are needed to reduce the risk for initial and repeated ankle sprains, and two ideas proposed for this goal are bracing and balance training. Unfortunately, studies evaluating these interventions are lacking, which led researchers to conduct a systematic review and meta-analysis. This powerful pair of studies collects all the available data on the topic with the goal of determining if bracing or balance training are truly effective for preventing ankle sprains. To collect data, investigators performed a search using four major medical databases for studies that evaluated the use of either balance training or ankle bracing to prevent ankle sprains. Balance training was defined as any type of program that involved exercises designed to improve balance, which were performed on a variety of surfaces and with eyes open or closed. Ankle bracing was defined as any type of device worn on the ankle joint, while taping was not included. This search led to 71 studies being reviewed, and eight of these fit the necessary criteria and were accepted into the review. The included studies contained data on 7,195 athletes that ranged from high school to professional sports leagues, with an average age of 20 years. The findings of these studies were then compared to one another, and their quality was assessed to gauge reliability. On the whole, results from the studies reviewed showed that balance training and bracing were both effective for reducing the risk and incidence of ankle sprains. Two of the three studies that evaluated bracing found that patients who wore these braces had a significantly lower incidence of ankle sprains and a 64% reduced risk for having a sprain compared to patients not wearing a brace. 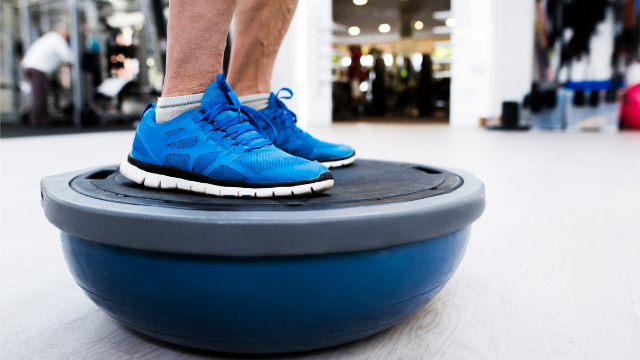 Of the six studies that evaluated balance training, five found a significant decrease in the incidence of ankle sprains in patients who participated versus those who did not, and these patients also had a 46% reduced risk for an ankle sprain. Overall, the quality of the included studies was moderate, with all studies scoring a 5 or higher on a 10-point scale, and one study scoring an 8. Taken together, these findings suggest that both balance training and bracing can reduce the risk for ankle sprains in athletes. More research is now needed to determine if either intervention alone or a combination of the two is most effective. In the meantime, athletes are encouraged to become proactive and see a physical therapist for a balance training program or additional advice on how to keep their ankle sprain risk as low as possible, especially if they have a history of ankle sprain.